Nature abhors a vacuum. Aristotle observed that the natural world falls over itself to ensure that every space is filled with something, even if it is nothing more than air. Stepping into a darkened place, my first instinct is to look up, to seek cracks and crevices where bats might dwell. An autumn shower at a National Trust property made an appealing shelter of an icehouse entrance and I took a moment to explore whilst raindrops dripped from the entrance. There were no bats to be seen, but life was far from lacking. Drone flies – the common name for the hoverfly Eristalis tenax – are gathered into a deeper crevasse in the ceiling; most unmoving, but one seems to have arrived later to the slumber party and is apparently still settling in, grooming and shifting. As important as shelter is stability, constancy of temperature allows a long winter to be slept in peace without early awakenings to continued inclemency. 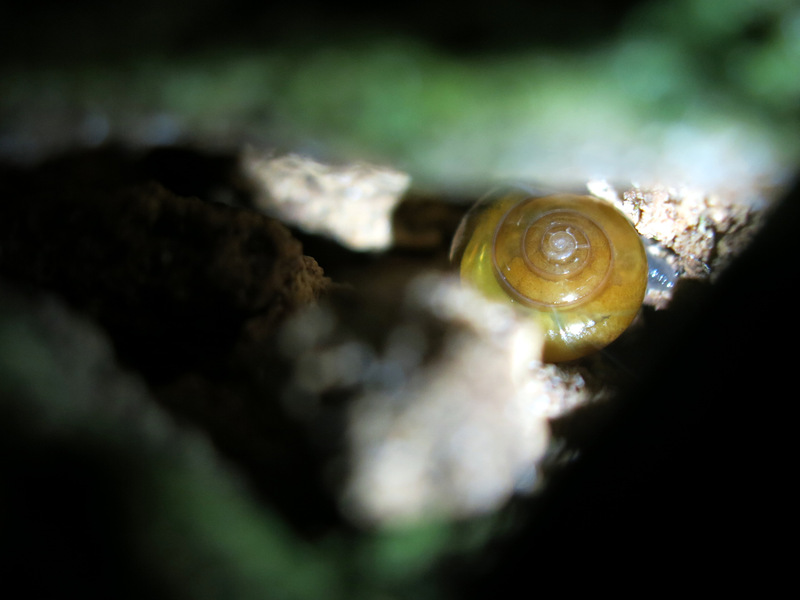 Yellow slugs and oxychilidae snails secrete themselves into indentations where the dampness suits their delicate skin, where they can spend a day without desiccating, waiting for their time to emerge and forage. A birds nest – a robin or a wren perhaps – occupies one of the larger cavities just inside the icehouse entrance, just beyond the reach of the sunlight. A thick electric cable runs past as though it were a barrier rail to keep the chicks in check. Arachnaphobes may appreciate the darkness which conceals the spiders dwelling just above head-height. Metellina merianae, the shaded orbweaver, is a specialist of damp, dark habitats where it spins its web, retreating to a cavity to return later and check its traps for a successful catch. Nature adores a vacuum, the hole over the whole, the cavity over the continuous. Age pits and scars everything from the living tree to the lifeless rock but our desire for neatness, for smooth surfaces and perfect condition can lead us to render structures inert and lifeless. And yet a crack in the brickwork is all it takes to allow a self-constructed community to thrive.